Humpback whales, Megaptera novaeangliae, are known for displaying a wide range of surface behaviors (i.e., behaviors seen from above water), such as breaching, head lunging, tail lobbing and spyhopping. Among these behaviors, pectoral fin displays are some of the most interesting. Humpback whales have the longest pectoral fins of all cetaceans — indeed the latin Megaptera translates to “giant wing” — and they will often lift their long fins well out of the water. This behavior can be seen when the whales are gathered in social groups as well as with solitary animals. Humpback whale swimming inverted with both pectoral fin raised clear of the water. These photographs were taken during Hawaii Whale Research Foundation research activities conducted under NMFS scientific permits 633, 882, 587 as well as various State of Hawaii permits. Their use is subject to certain restrictions. 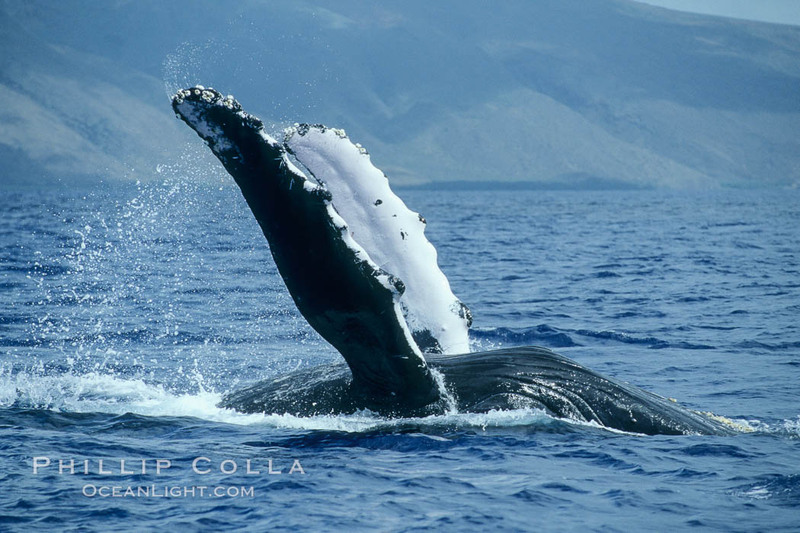 Keywords: humpback whale photo, megaptera novaengliae, pectoral fin. These photographs were taken during Hawaii Whale Research Foundation research activities conducted under provisions of NOAA / NMFS and State of Hawaii scientific research permits.